The Find My iPhone app has a new trick in iOS 10.3—locating a misplaced set of AirPods. Well, if they're on and connected, anyway. As of iOS 10.3, Apple’s Find My iPhone app can also help locate your AirPods—under the right conditions, anyway. Since the AirPods connect to your iPhone with Bluetooth, if they’re powered on and connected, you’ll be able to see their location in the app and even get them to play a sound so you can find them if they’re under a couch cushion or shoved in the pocket of a forgotten jacket. But if they’re not connected, the feature isn’t incredibly helpful. When you launch Find My iPhone, you’ll see your AirPods. You don’t need to set them up in this app at all, since you already paired them to another device that’s connected to your iCloud account (typically an iPhone or iPad). 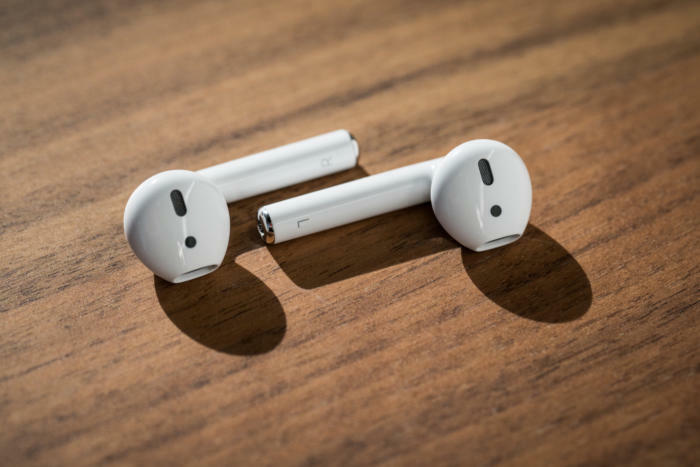 If that device is in this list, your AirPods will be too. Tap the AirPods in the list for options. You can have a sound play, and then mute either the left or right AirPod. This is great if you’ve only lost one, so you can isolate the sound from the misplaced earbud without being distracted by sound from the one you still have. The sound starts off quiet and gets louder gradually. Unfortunately, if your AirPods aren’t connected, they can’t play a sound. If they’re just in their case asleep somewhere, you might see their last known location on the map, and if you tap Play Sound, the app will say “Sound Pending.” Now it’s up to you to find those AirPods yourself, and when you do, they might start playing an obnoxious beeping sound when they finally reconnect to your iPhone. Just open Find My iPhone, tap the AirPods in the list, and look for the Stop Playing button. Watch the video for more, and remember if your AirPods get really lost, Apple does sell replacements so you don’t have to shell out for a whole new set.